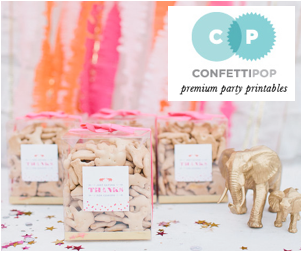 I didn't realize how much you all would love the chalkboard cookies I designed for the Graphic + Glitz dessert table. Many of you have asked for a tutorial, and I found some time to do a little demo yesterday. You'll notice that the original cookies were squares, but the ones I used yesterday were some rounds that I already had on-hand. 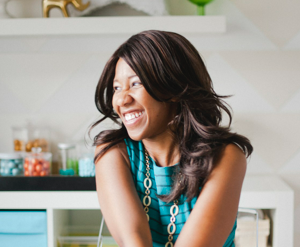 You'll be pleasantly surprised at how easy these designs are to create. 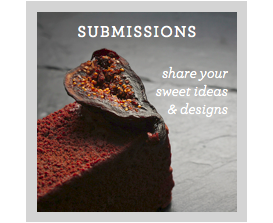 We talked about dessert stencils last week, and this tutorial relies on custom stencils. Enjoy! You'll only need a few simple tools for this DIY. It's so simple! Bake your cookies and allow them to cool. Prep your royal icing and tint with black coloring. Flood your cooled cookies with the royal icing and allow to set. Choose a font and print a 1" letter of your choice on regular printer paper. Using a fine-tipped marker, trace your letter onto parchment paper. Use your X-acto knife to cut out your stencil. Remember to cut out the part of the letter you want to fill in with "chalk". For the O, I left a small strip of paper attached at the top and bottom of the center of the O to keep it in place while I filled in the stencil (see image #4). Dip a toothpick into your extract, then sprinkle the open areas of the stencil with lustre dust. Using the toothpick as a pencil, gently fill in the stencil. Typically, you would use a brush to apply the lustre dust, but in our case, we want the definitive chalk-like strokes that the toothpick gives rather than a smooth finish of a brush. Set aside an allow to dry. I'm loving these cookies! They're so fun! 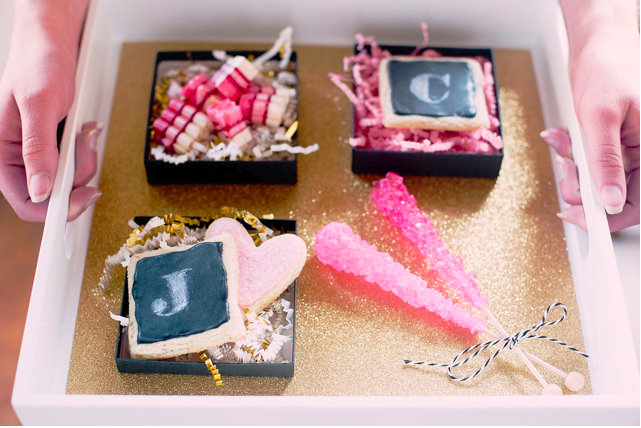 Such an easy way to marry the chalkboard trend with baked goods...thanks for sharing! That is so awesome! I can see these as a hot item for teacher end-of-school treats! Such the cute idea! Thanks for sharing it! You are very clever! THANK YOU, THANK YOU for the tutorial! I was in love with these cookies the moment I saw them and scoured the internet looking for the instructions, to no avail! I'm doing an alphabet/book birthday party for my son and these will be perfect for the dessert bar...perhaps even as pops! :-) I love how simple, yet beautiful they are and how they can be dressed up or down to fit the occasion. I'm so glad that you guys enjoyed the cookies and the tutorial. It really is Incredibly simple. In fact, this was only my second time flooding cookies and that went surprisingly smoothly, too. Lisa Joy, if you do attempt the cookies for your son, I'd love to see them. great idea, and neat teacher gift idea!!! These are brilliant! 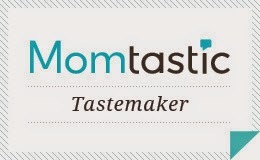 I posted on ediblecrafts.craftgossip.com yesterday (as you know) but had a computer snag when I tried to leave a comment here, so yay, so glad you spotted it! Did I mention these are brilliant? Thanks so much for swinging by again today to leave a comment, Meaghan! Okay, these may be the coolest cookies I have seen in my life, and I've seen a lot of cookies. Wow! Very inspirational. These look terrific. I've had a lot of trouble making black icing before. I use black food colouring from the supermarket, nothing fancy, and it seems to just stay grey or be too runny to be usable. Do you have any tips? Karlee, Melbourne. 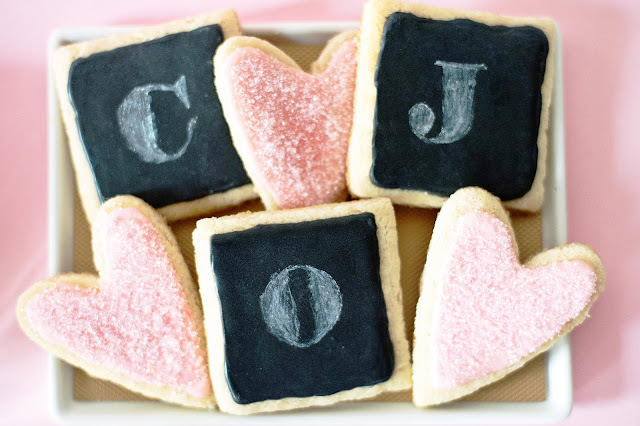 These chalkboard cookies are too adorable! I love these cookies. I wanted to ask what font you used and what color luster dust you used also. Thank you. What a fabulous effect! Love em!